In this article we review the main causes of sudden death in adults, in children and young athletes. The exact definition of sudden death is not yet a consensus in the medical community. Some groups define sudden death as an unexpected death that occurs so quickly from the onset of symptoms that their cause can not be established in clinical form with absolute certainty. This definition rules out any kind of violent death, whether by homicide, suicide or accidents, as well as complications of previously known diseases, such as severe infections or cancer. Other groups prefer to define sudden death as an event that occurs so at first inexplicable and that takes the patient's death within the first hour after the onset of symptoms. Also fall within the concept of sudden death people who are found dead unexpectedly and inexplicably. How are clinically unknown cause of death, individuals who suffer sudden death should always be taken to autopsy so that the origin of death can be clarified. In most cases of sudden death, the cause originates in the heart. pulmonary, vascular and brain problems may also cause the patient to a death suddenly and unexpectedly. In fact, there are dozens of possible causes for sudden death. Situations like accidental ingestion of poison, electric shock high voltage or asphyxiation after choking on an object or food can cause sudden death. But it's not about that kind of sudden death caused by accidental situations, which we will talk. What we describe below are sudden deaths caused by natural events, ie, triggered by an illness or defect of the body. Extensive necrosis of heart muscle that leads to a sudden cardiac pump failure. Changes in the normal electrical conduction of the heart that lead to the development of malignant cardiac arrhythmias. The massive heart attack is more common in people but old, already with a history of previous heart attacks and / or risk factors for cardiovascular disease, such as diabetes, hypertension, high cholesterol, smoking, etc. The clinical picture is similar to any infarct with chest pain with tightness, which may or may not radiate to the left arm or neck, shortness of breath and sweating. In severe heart attack, the patient goes into circulatory collapse quickly, hypotension and loss of consciousness. Malignant cardiac arrhythmias not only occur after a heart attack. Indeed, various cardiac diseases can lead to arrhythmias and hence sudden death. We call malignant arrhythmia all electrical change of heart that prevents it from pumping blood effectively. 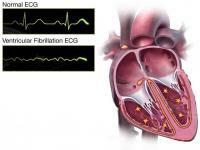 The most serious type of cardiac arrhythmia is ventricular fibrillation. 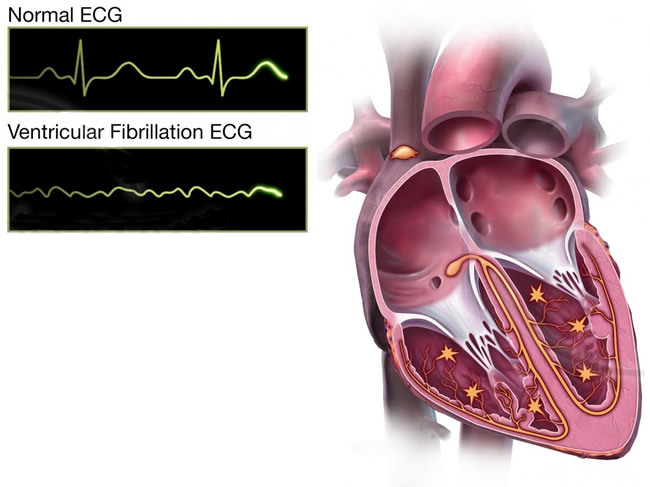 The patient's heart with ventricular fibrillation does not contract effectively and the patient goes into cardiac arrest, despite having electrical activity in the heart. The patient is pulseless electrical activity because of ventricular fibrillation is so chaotic that it can not operate effectively in the contraction of heart muscle. Symptoms of malignant arrhythmia often palpitations, chest pain, tachycardia (accelerated heart too) and hypotension. The patient may rapidly progress to loss of consciousness. Malignant arrhythmias are a form of sudden death can be reversed if they are recognized and treated immediately. The treatment is done with a defibrillator, which is a machine that emits electrical discharges in order to abort a malignant arrhythmia. Today, places of great flow of people, such as airports and shopping malls, have automatic defibrillation machines, able to recognize arrhythmias and deliver an electrical discharges whenever necessary. Patients at high risk of malignant arrhythmias, especially those with heart failure, can receive an implantable defibrillator, which is a kind of cardiac pacemaker can recognize and release electrical discharges if the patient goes into arrhythmia. Pulmonary embolism (pulmonary embolism) is another common cause of sudden death. This picture is usually caused when the patient has a stroke in the legs and a piece of this thrombus is released, traveling through the bloodstream towards the lungs. If the embolus (clot that travels through the bloodstream) is large enough, it can block the pulmonary artery, causing sudden and extensive infarction in the lung. Pulmonary embolism should be considered in all supposedly healthy patient that presents a sudden death days after major surgery or trauma. Another catastrophic event that can lead a person to death in a few minutes is the rupture of an aneurysm, either brain or aorta. Aortic aneurysms are more common in older people, smoking, hypertension and high cholesterol. The aneurysm of the aorta is a defect that evolves over the years, but its failure is a medical emergency that can lead the patient to death in minutes to hours. aneurysms larger than 5.5 cm are at greatest risk of failure. Symptoms of rupture of an aneurysm of the aorta are abdominal or chest pain, tachycardia (rapid heart), skin pallor and hypotension, which occurs by rapid and massive blood loss. The only chance of survival occurs when the picture is quickly recognized and the patient can be referred for surgery to contain the bleeding. The above rupture of a cerebral aneurysm is even more dramatic than that of an aortic aneurysm. In this case, it is not the massive loss of blood because of the rapid death, but increased intracranial pressure and compression of the brain by bleeding it occupies space within the skull. The clinical picture usually begin with sudden and intense headache. It is very common for the patient to note that this pain is more intense than he ever felt in his life. In severe cases the patient progresses to vomiting, disorientation and loss of consciousness. Most cases of stroke does not cause sudden death, but depending on the extent of cerebral infarction and the affected area, the patient may develop unfavorably very quickly. Lesions of the brainstem can be dramatic, as this is the region that controls vital functions such as breathing, for example. The hemorrhagic stroke, which causes intracerebral hemorrhage, is another form of stroke that can evolve with relatively quick death. This form of stroke usually occurs in older people with poorly controlled hypertension. Patients with epilepsy have a risk of sudden death slightly higher than the general population, especially young adults. The causes are not well understood, and most cases occur during sleep. The sudden and unexplained death of epilepsy accounts for about 2 to 18% of deaths in epileptic patients. Patients with frequent episodes of seizures are the group most at risk. Other risk factors include poor adherence to antiepileptic treatment, alcoholism, episodes of nocturnal seizures and aged between 25 and 40 years. Sudden death associated with physical activity is a rare event, but devastating, because the victims are often young and apparently healthy people. The vast majority of cases have cardiac origin, caused by cardiovascular disease previously existing but undiagnosed until the time of cardiac arrest. The cause of sudden death is usually a malignant cardiac arrhythmia. Despite the great impact media that the sudden death of an athlete usually cause, the incidence of this event in the last 20 years has been rare, occurring in only 1 out of 300,000 athletes. Fortunately, most of these changes can be detected early through medical tests. Specifically we talk about the sudden death in amateur and professional athletes in an article to be written briefly. The sudden infant death syndrome (SIDS), also known as sudden death syndrome infants (SIDS) is the leading cause of death among infants in the first year of life. As the name suggests, the syndrome of sudden infant death is a sudden death frame baby in its first year of life, which is inexplicably and unexpectedly in apparently healthy children. Most cases are associated with sleep, so it is also known as "cot death". The occurrence of sudden death is rare in the first month of life. The greatest risk period occurs between 2 and 4 months. After 4 months, the risk begins to drop sharply, so that only 5% of cases occur after 6 months of age. We do not know the exact causes of sudden death in infants, but most likely that there are multiple factors. Among the risk factors, some stand out as mothers who smoke, rooms with high temperature and babies who share a bed with their parents or a brother. But the main and most famous risk factor is the position in which the baby sleeps. Children who sleep on their backs are much less likely to make a sudden death frame when compared to children who sleep on their side or stomach. The popularization of this fact and parental guidance by pediatricians have led to a reduction in the incidence of sudden death in infants worldwide.